It has been a very busy day on social media for Canadian NCAA players, as three of the most talented in the Canadian pool have all declared their intention for the NBA Draft. Last night it was Mfiondu Kabengele of Florida State that announced he would be hiring an agent and enter the draft. Kabengele managed to improve on every stat this year from his freshman campaign including points (13.2), rebounds (5.9), minutes played (21.6), and field goal percentage (50.2). Standing at 6-10 and weighing 250 pounds, the former Don Bosco standout will surely draw some interest from NBA scouts during pre-draft workouts, but it will remain to be seen as where exactly he will land in the draft rankings as we get closer to draft day. 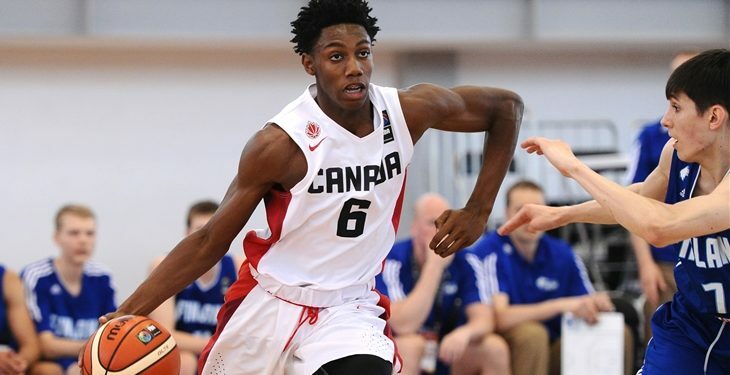 The second to declare was none other than Duke’s RJ Barrett. Barrett has been a perennial top 3 pick for this class since almost the day he entered high school 5 years ago, and it is no surprise that he has managed to keep that value throughout the years. The Mississauga native managed 22.6 PPG, 7.6 RPG, and 4.3 APG in his only season with the Blue Devils. What makes those numbers even more impressive is the fact that Barrett had to share the ball with the consensus number one overall pick, Zion Williamson, for the majority of the season while racking up those stats. If you could poke any hole in Barrett’s game, it might be his outside shot, but even that is a fixable flaw. The rest of his game, especially his playmaking ability, speaks to a player that could contribute at a high level in the NBA for over a decade. The final player to declare today from Canada is Francophone and Montreal native Luguentz Dort out of Arizona State. Dort was the 2018 Biosteel All-Canadian MVP, while also being the only player that year to truly test Barrett at any of the showcase games both of them attended and faced off. Dort turned that into an impressive freshman year with the Sun Devils, averaging 16.1 PPG, 4.3 RPG, while shooting 40.5% from the field. What has always been clear about the Athlete Institute product however, is that he is a gamer. According to Draft Express, when Dort was needed most in the tournament his numbers shot up to 28.5 PPG, 5.5 RPG, while adding 2 APG in Arizona State’s two March Madness games this year. At 6’5 and 224 lbs, Dort is an athletic guard with NBA size and a hunger to compete that will surely land him somewhere in the top 20 following his draft workouts. Ryan Greco is a broadcast commentator, radio personality, and writer based in Mississauga. He provides game recaps, player profiles, and interviews pertaining to all levels of basketball across Canada for NPH. He is also a broadcast commentator for FIBA. VIDEO: Henry Carr Crusaders Win First EVER OFSAA Championship!